Business Director of Left Travel, Ashley Joslin, has been selected to attend the Phocuswright Young Leaders Summit in Europe. 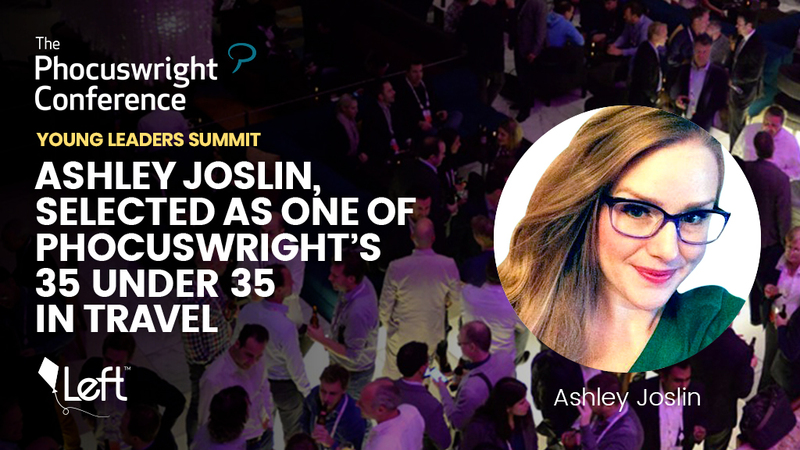 Left Travel, an industry leading metasearch travel company, is excited to announce that our Business Director, Ashley Joslin, was selected as one of Phocuswright’s thirty-five young leaders under 35. Ashley will be attending the Young Leaders Summit, an event that recognizes the brightest talent in the travel industry. Throughout the summit she will receive executive development training through experienced guest speakers, workshops, and networking opportunities. This years summit will be held in Amsterdam in conjunction with the Phocuswright Conference. Ashley will be joining Online Marketing Manager, Ryan Kirkbride, at the Young Leaders Summit, in the spring of this year. As the Business Director for Left Travel, Ashley leads a global team with offices in Canada and Bangladesh. As the strategic director of the business and marketing strategies, Ashley has been successful in supporting and scaling her team to drive $650 million in gross travel booked annually through 16 international brands.